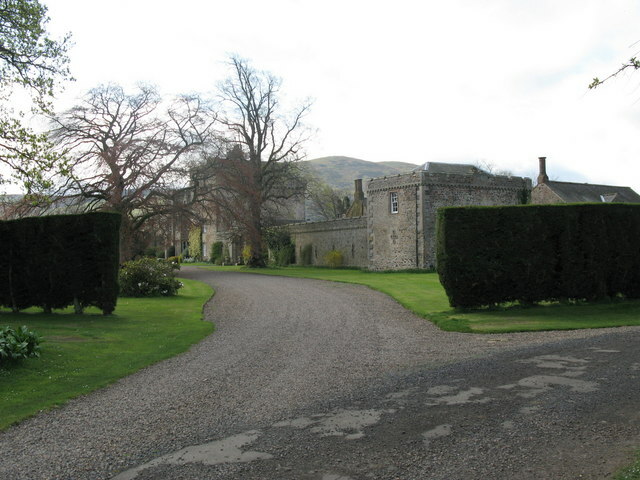 Notes: Coupland Castle is situated in the village of Coupland, 4 miles (6 km) to the north-west of Wooler, Northumberland, England. It is a Grade I listed building. This is a tower house rather than a castle, and was probably built at the end of the 16th century, sometime after 1590. The tower has three storeys, with an attic on top and a small projecting tower carried up the south wall. Between the two towers there is a small stoner jamb with the date 1594 inscribed on it A date stone over a fireplace in the tower engraved 'GW 1615 MW' is thought to represent George and Mary Wallis, owners at that date. The castle has been added to over the years and was restored in the 19th century. In 1820 it was extended when a three-bayed two storeyed house was built adjoining the tower. The Bates family owned the estate in the 18th century. Elizabeth Bates, heiress to the estate, married Matthew Culley (born 1731), the noted agriculturist, in 1783. In 1869 the house was the residence of a later Matthew Culley, High Sheriff of Northumberland in that year. The Culleys sold the estate in 1923. The present owner Robin Jell bought the property in 1979 and lives there with his second wife Fiona.